Point Reyes National Seashore offers coastal scenery, recreation, wilderness, and historic sites. This includes numerous beaches of widely different character from wild surf-pounded beaches to sheltered lagoons. Several beaches are accessed only by hiking trails. Point Reyes also features its historic and scenic lighthouse, a network of trails, an elk herd, and even a series of historic dairy farms in its interior. Download the Point Reyes National Seashore Map - (PDF file). There are three visitor centers. The Bear Valley Visitor Center is the park headquarters with extensive exhibits and programs. It's located off of Highway 1 on Bear Valley Road near Olema. Open 9am-5pm daily, weekends and holidays 8am-6pm. Phone: (415) 464-5100. The Patrick Visitor Center is located at Drakes Beach with exhibits and information. Open weekends and holidays, 9am-5pm, Friday to Tuesday in summer. Phone: (415) 669-1250. 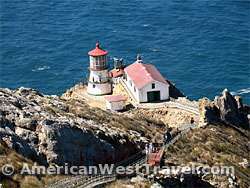 The smaller Lighthouse Visitor Center is located at stairs leading to the Point Reyes Lighthouse at the tip of the peninsula. Thursday-Monday, 10am-4:30pm. Phone: (415) 669-1534. Point Reyes Lighthouse. The historic lighthouse is one of the park highlights. The access road becomes slow and narrow as you approach the tip of the peninsula. It is roughly a half mile, somewhat uphill walk from the parking area to the Lighthouse Visitor Center. From there, 300 steps lead down to the lighthouse itself. This is a sharply uphill walk on the return. The visitor center and lighthouse are open for touring year round, Thursday-Monday, 10am-4:30pm. Both the lighthouse itself and the adjacent equipment building are open to visitors and contain a number of exhibits and informational panels. Note that the lighthouse area is very exposed to the elements. High winds and very inclimate weather are possible, so bring warm clothes along. The park service will close the stairs if the weather is too severe. Beaches of Point Reyes National Seashore. Point Reyes offers some of the world's most amazing coastline with the spectacular diversity of its beaches. Point Reyes Beach on the northwest side of the peninsula faces the open Pacific Ocean and the incoming weather, with the possibility of very rugged surf. The beaches sheltered in Drakes Bays on the south side offer a calmer experience. Beaches on Tomales Bay are even more sheltered, with warmer water. You will also find lagoons and sand dunes. Be aware of the park service's advisories regarding unsafe conditions such as dangerous surf, slippery rocks, debris, and unstable cliffs. The NPS Guide to the Beaches of Point Reyes covers all the park's beaches and safety issues. Some of the more interesting beaches are described below. Point Reyes Beach (Great Beach). The ten-mile long beach faces the open sea and has the potential for the wildest, most dangerous surf. Be aware of "sneaker" wave which can reach far above the tide line. Drakes Beach. Wide, sandy beach backed by dramatic white cliffs, on the sheltered side of the peninsula. The popular beach has car access, a visitor center and museum, and a nice cafe open on weekends. Limantour Beach. A long narrow sandspit between Drakes Bay and an estuary. Very rich wildlife area all year round. Gray whales with their calves are close to the shore during the spring. Wildcat Beach. A walk-in beach accessible by either a hiking trail (5.5 miles) or biking trail (6.7 miles). The beach features a walk-in campground and Alamere Falls. Tule Elk Preserve. A herd of about 400 elk roam freely on the north end of the peninsula near Tomales Point. While the area's original elk had disappeared by 1860, ten elk were re-introduced in 1978 with protected status, and the group has since grown to its current size. The best place to observe s along the Tomales Point Trail although visitors can often observe elk near the roads from their car. The elk are especially active during rutting season, July through September. Point Reyes Hiking. There are 150 miles of hiking trails in the park, many miles in designated wilderness. Backpackers may stay in the hike-in camps noted below. For more details, refer to NPS' Point Reyes Trail Guide and Suggested Hikes. Trail maps are also downloadable in PDF format. Point Reyes Camping and Point Reyes Hostel Lodging. The four campgrounds in Point Reyes are hike-in (or boat-in, Tomales Bay only) and require trail hiking or biking to reach. Each campground has a vault toilet and water faucet (be prepared to treat water), with a small number of individual and group sites. Permits are required and may be reserved up to three months in advance. For details, phone (415) 663-8054. The Point Reyes Hostel offers dormitory style lodging within the park. Reservations are required. Use above link or Phone: 415-663-8811.